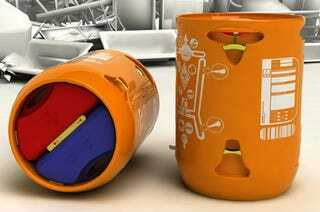 Tucked inside these 50-gallon drums is a life-saving package of stuff to help people in crisis zones. Designed by Toby McInnes, the container has a tent, storage annex, photovoltaic strip tarpaulin/blanket, multifuel stove, lighting rig, tool kid, medical kit, water filtration system, generator and battery pack and emergency radio inside to sustain people in an emergency. See just what it looks like unpacked after the jump.